People born at the time of the Chinese Year of the Horse are assumed to display some of the characteristics of the animal. Their strength, cleverness and free spirit are believed to be apportioned on an individual and to influence their personality. The Cancerian Horse, in particular, benefits from these touches of vitality to their character. 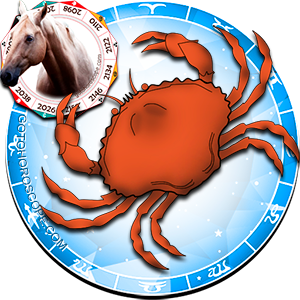 Cancerians are known to be a little too sensitive, so the inclusion of the more placid Horse brings some composure to these personalities. The Cancerian Horse still retains his or her dreamy imagination, but without the usual, sometimes hindering, restraints of timidity. The ancient Chinese regarded the Horse as a stabilizing creature, in Astrological terms, who delivered balance to all those arriving in their designated years. The Cancerian Horse personality is thought to consist of all the good-natured qualities of the Cancer sign with some added emotional stamina. This slight reduction in sensitivity inspires the Cancerian Horse person to be far less clingy and much more self-sufficient. Their underlying free-spirited natures are released, revealing individuals with less shyness and more sense of adventure. This gives them a slightly more demanding personality, but also one that is not as reliant. A Cancerian Horse sign combination is a good mixture, creating well-balanced, likable people. The Cancerian Horse is generally a cheerful, optimistic personality who likes to communicate and feel part of things. He or she does not have the typical reserved Cancerian traits, so they do not find it difficult to join in the conversation with others. A personal relationship with the Cancerian Horse will often include lots of long intimate chats. When these people seek a soulmate, they hope to find someone on the same demonstrative and intellectual wavelength as them. Such partners will keep their interest and prevent them from feeling restless. These personalities, once domesticated, love the intimacy and security of family life. A Cancerian Horse personality is kind, considerate, honest and hardworking, and is one that will get along with most others. With their good imagination and caring persona, these characters will make friends easily and be able to apply themselves to a wide variety of occupations. Their free-spirited disposition allows them to enjoy traveling, and with their lesser degree of insecurity the Cancerian Horse is not fearful of venturing away from home from time to time. These Cancerians enjoy the outdoors and the freedom to roam, but still look forward to returning home. If the Cancerian Horse is given enough personal space, you will rarely spot a weakness in their characters. It is only when they feel restricted or backed into a corner that you may encounter their negative traits. A Cancerian Horse can become blunt and fiery tempered if he or she feels they are not being listened to. This impatience and frustration can result in sulking, but these personalities soon calm down once they have vented their grievances. As Cancerian Horses adore talking, it is never very long before they decide to convey their remorse for losing their temper. They are then usually happy to discuss a compromise. I am a cancer horse ! 1990.
yep described me pretty accurately here. Does anyone know compatibility to tigers? esp leo / tigers? I am a scorpio horse with an eye on a cancer horse.... sounds pretty accurate... especially the traveling part. would that include shutting me out when I get intensely emotional? The cancerian horse as portrayed is acurate, as I am such. Much thanks the horoscope. That's definitely the sign of my cousin he's the cancer water horse! He was born from year 2002 which was year of the water horse. Described to a T! its missing the sexual part... Whoever gets in bed with a Cancer-horse will not want to get out!!! See why my CD Wife likes her steed, faithful sensable horse who l*ys it down! On that note ya l*ing on the gay thing all cancers are pure FREAKS. Guy or girl but when we lock in our field area b*tchs get lost on our everlasting land. Adventure is Virgos little name which we are drawn to. How could I read about my (Cancer/Horse) compatibility with, say, Virgo Horse? My fiance is a cancer horse and I am a Virgo horse!!! Completely accurate. Even the backed into the corner thing.